If you can get past the naked exploitation of this mercenary sequel, U.S. Marshals is a sort of brain-rotting kind of fun (how's that for an endorsement?). 131 min. Warner Brothers. Director: Stuart Baird. Cast: Tommy Lee Jones, Wesley Snipes, Robert Downey Jr., Joe Pantoliano, Kate Nelligan, Irene Jacob, Daniel Roebuck, Patrick Malahide. Destined to be a footnote in cinema history, U.S. 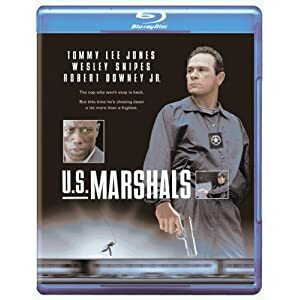 Marshals sequelizes The Fugitive by putting Tommy Lee Jones front and center to reprise his Oscar-winning role of Sam Gerard. That's not necessarily a terrible idea on its (craggy) face, but the success of The Fugitive makes it a tough act to follow and one that's basically unrepeatable. So what's a writer to do? Devise a cunning original plot that showcases Jones in an entirely new adventure? Nah, too much work. So screenwriter John Pogue (Ghost Ship) repeats the unrepeatable. To be fair to Pogue, this decision was almost certainly above his pay grade, and probably went a little something like this: "John, what do people love about The Fugitive? Besides Harrison Ford. Right: Tommy Lee Jones hollering. He won an Oscar for that. So make sure he does it again, y'know, on the outskirts of some woods: think 'trailer moment.' And of course, we need a fugitive. People love the fugitive. No, not Harrison Ford, he's not available. But we want people to fondly remember Harrison Ford and why they love The Fugitive so much, so make the guy innocent. It worked the first time; it'll work again. What else? People loved the train crash, so how about a plane crash? A 727 oughta do it. Also, the two men need to have close brushes when they can look significantly into each other's eyes and size each other up. One of these must take place at a great height from which the fugitive can jump and escape. No—not a dam. We already did that! Try a rooftop. It'll be a super-impressive stunt, though that's only five seconds of running time, so make sure there's lots of banter between Tommy and Joe Pantoliano and the rest of his team. See, it writes itself!" If you can get past the naked exploitation of this mercenary sequel, U.S. Marshals is a sort of brain-rotting kind of fun (how's that for an endorsement?). Jones first appears in a giant chicken suit—it's no Sean Connery in a giant teddy bear suit (for that, rent the estimable 1998 movie The Avengers), but it's good for a couple of chuckles. This time, the fugitive is Mark Warren (Wesley Snipes), framed for the murder of two Diplomatic Security Service agents, but not as innocent as he'd have you believe. The circumstances allow the DSS to foist Special Agent John Royce (a disappointingly tamped-down Robert Downey Jr.) on Gerard and his warrant squad: Deputy Marshals Cosmo Renfro (Pantoliano), Noah Newman (Tom Wood), Savannah Cooper (LaTanya Richardson) and Bob Biggs (Daniel Roebuck, chewing the Chicago scenery)—they're the type who love to fling insults at each other in Irish bars. Completing the film's motley crew, Irène Jacob—star of foreign art films like The Double Life of Véronique and Three Colors: Red—hangs around the picture as Snipes' girlfriend. Jones is fun to watch, Jerry Goldsmith's score amps up the excitement, and director Stuart Baird (who also edits films) cuts together a couple of exciting action sequences, but there's no good reason a picture this slight should go on for 131 minutes. Warner does it again with another splendid-looking catalog title pulled off the shelf, dusted off, and given a demonstrable hi-def upgrade. The transfer earns better-than-passing grades for its sharp detail and palpable texture, lively color, and well-calibrated contrast and black level. There's no sign of any digital tinkering or video sheen, the image instead retaining its film-like character. Audio also impresses in a potent lossless DTS-HD Master Audio mix that seriously capitalizes on the film's action sequences and robust Jerry Goldsmith score; placement of effects and dialogue is excellent for an immersive and effective aural experience. U.S. Marshal retains its bonus features in its Blu-ray upgrade, starting with a commentary by director Stuart Baird. Baird has always been a man of few words, but he takes that impression to absurd lengths here, going quiet for long stretches; few will want to hang around for the whole stretch here. More engaging is "Anatomy of the Plane Crash" (12:44 with "Play All" option, SD), a blow-by-blow account of the making of the film's biggest action sequence, comprising "The Crash: A Five-Act Play," "Model Airplanes," "Exterior Sets," "Interior Sets," "Landing Locations," "Escape Under Water," "Crash Research," "Miniature Road," and "Crash for Crash: U.S. Marshals vs. The Fugitive." Another pretty cool bonus feature is "Justice Under the Star" (18:27, SD), a featurette recounting the history of the U.S. Marshal's Service and its presence in the movies (by way of demonstration, we also get the trailers for Cahill U.S. Marshal and Wyatt Earp). Rounding out the disc is the film's "Theatrical Trailer" (2:29, SD). All site content © 2000-2019 Peter Canavese. Page generated at 04/17/2019 08:39:46PM.